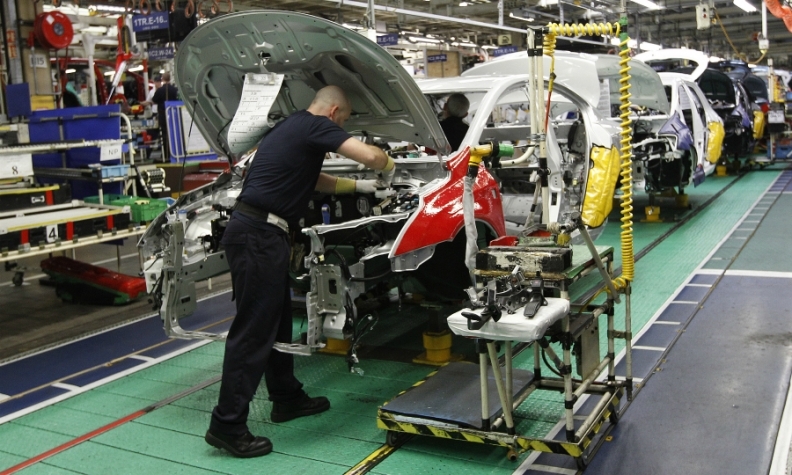 A worker is pictured on an assembly line at Toyota's factory in Burnaston, England. LONDON -- Toyota intends to build its next-generation Auris at its UK car plant on the assumption that the government will secure a transitional Brexit deal, two sources familiar with the matter said. The final decision is due to be made by the end of the year, according to the sources and a government briefing document released to Reuters under a freedom of information request. The new Auris would keep one of Britain's biggest car plants operating, secure thousands of jobs and provide a welcome endorsement to Prime Minister Theresa May. Toyota builds the current-generation Auris compact and Avensis midsize models at its Burnaston plant in central England, according to Automotive News Europe's European car assembly plant map. The current Auris is due to run in about 2021, but automakers tend make model decisions up to three years in advance partly to organize supply chains. "Toyota UK management have a working assumption that the UK will retain the next generation Auris because it is too early to determine the nature of the trading relationship with the EU," one of the two sources familiar with the matter told Reuters. "They believe that there will be a transitional period," according to the source who said the firm was highly likely to build the next-generation Auris in the UK. The final decision will be made by Toyota's board by the end of the year and announced shortly afterwards, the sources told Reuters. In March, the firm said it would invest 240 million pounds ($314 million) to upgrade to a new global car-building platform but has not confirmed which models it will build going forward. The platform investment decision was helped by a government letter reassuring the firm over post-Brexit trading arrangements, sources told Reuters earlier this year. "Toyota made machinery investments in Burnaston ahead of model decisions this year," read a government briefing note prepared for foreign minister Boris Johnson's visit to Japan earlier this year, released to Reuters in a freedom of information request.